Russia’s Polina Tsurskaya is the current junior ladies’ record-holder for the highest free program and combined total scores. 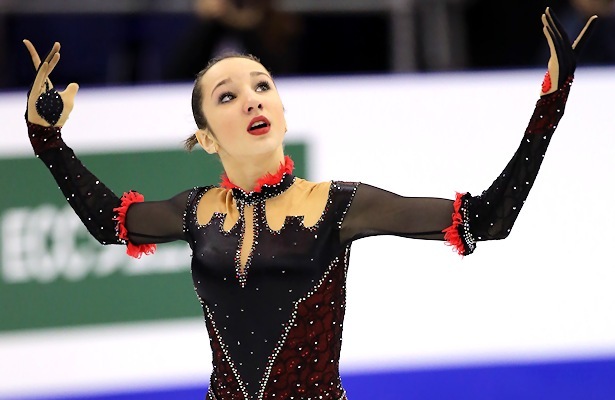 A year ago, Russia’s Polina Tsurskaya took the international junior scene by storm, winning each event she entered including the 2015-16 ISU Junior Grand Prix Final and the Youth Olympic Games. Unfortunately, bad luck struck at Junior Worlds when top favorite Tsurskaya fell during the morning practice before the Ladies short program. The fall further aggravated an injury to her ankle that was sustained the day before she left for Junior Worlds. As a result, the skater had to withdraw. The season was over for the teenager who moved from Moscow to Omsk when she was 11 in order to pursue a career in figure skating. The recovery took a long time. For three months, Tsurskaya, who turned 15 in July, was off the ice. Eventually the Youth Olympic champion recovered, however, her coach, Eteri Tutberidze, did not let her skate at the junior test skates in early August. Tsurskaya is currently scheduled to compete next week at the Junior Grand Prix event in Saransk, Russia, as well as the event in Tallinn, Estonia, two weeks later. The 2016 Russian junior national champion hopes to regain her leading position in the junior ranks this season. Choreographer Daniil Gleikhengauz created two new programs for the 15-year-old. The short program is set to “Light of the Seven” from the “Games of Thrones” soundtrack, but the storyline of the program has nothing to do with the epic fantasy as Tutberidze pointed out. The story is about an artist who is never satisfied with her work until she starts to draw on her own body. “The result is so dazzling that with the words, ‘I experienced perfection’, she destroys her work,” the coach explained. Interestingly enough, Tsurskaya loves drawing in real life. The free skate is to the lyrical piece “February” by Leonid Levashkevich, and has a less extravagant theme. It is simply about love. Tsurskaya is a tall and powerful skater. She grew over the summer and is now 172 cm (nearly 68 inches). Tsurskaya’s high jumps were the first thing Tutberidze noticed about the girl that came from Omsk before taking her into her group. However, her older brother Igor, now 24, grandparents, other relatives and friends stayed back in Siberia. “I miss them a lot”, the skater admitted. Nevertheless, the move paid off. Soon after training under professional conditions in Tutberidze’s group, Tsurskaya drew attention. This was also the point when she realized that figure skating was her calling. Even specialists from other sports were quick to recognize Tsurskaya’s qualities. Athletic coaches watched the skater running on the track during off-ice training and asked her to try pole vault. “They know their material, but maybe we can work even better with this material,” said Tutberidze. However, Tsurskaya was not interested in switching to athletics. More than that, Tsurskaya is also fearless and bold, especially on the ice. Daisuke Takahashi became the first Japanese single men’s figure skater to win an Olympic medal (the bronze) at the 2010 Winter Olympics. More on Daisuke Takahashi from Golden Skate.